Do you ever go into a store for one thing and leave with four others? This happened to me the weekend before last. I popped into town to pick up a christening present for a friend and noticed that Debenhams had a sale on so figured I’d have a quick look at the sandals. 20 minutes later I emerged loaded with four pairs of shoes. Excessive? Maybe. Necessary? Always. 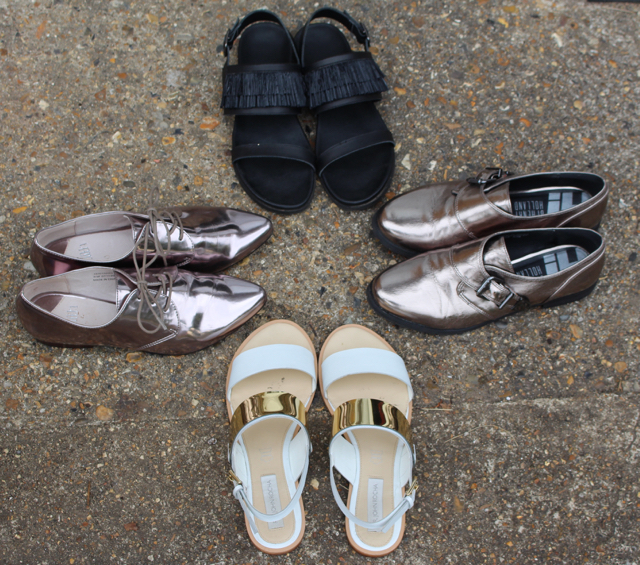 The shoes in question, two pairs of sandals from the John Rocha by Rocha line, one pair of Red Herring brogues and one pair of H by Henry Holland brogues. All for £80. I’m not saying that’s cheap but I am saying that I got them all on sale. My main priority has been finding a new pair of sandals for Summer. I have some super old gladiator-style metallic orange ones from Zara which are starting to look a little battered. I wanted something structured and sturdy that I could wear to work and on holiday. I tried some ASOS sliders but didn’t like the way they fit. I also can’t wear the ones that separate the big toe from the next one. They just freak me out. Sandals for me are like buses. You wait patiently for one and then three come along at once. Or in my case, two pairs at once. The first pair are two tone white and gold and look all sophisticated. The second pair are chunky and black with a thin strap across the toes and black fringing over the foot. I love them and have worn them nearly every day since picking them up. As for the brogues. These were bargain central. At the back of the store, where I imagine no one ever looks, they always have a sad couple of shoe racks, packed with fugly shoes nobody wants. Except me. This is usually the first place I head as I am a self-confessed fugly-shoe lover. And these two brogues were right up my street. The H by Henry Holland pair are the chunkier of the two. They’re a weird iridescent pinky-green colour, have a thick sole and a badass buckle on the side. All for around £13. As for the metallic pink, pointy number, what’s not to love? I tend to stay away from super pointy shoes as they kill my toes, but flats, I’m down with. My only problem is that I’ve run out of room in my wardrobe to store them, so am now creating a weird stacked feature of them that people comment on when they come over. Next Post Want it on Wednesday: Would You Like a Flake with That? What's not to like? Shoes are your friend 🙂 And that's a real bargain too.